In a blog post on the Mercury-project experiments recovering Redstone booster rockets (located here), I deferred on commenting outside the historical and engineering context. But as I implied with hyperbole in that post, it is a well-kept secret that reusable rockets, in some form or another, are much older than the oft-cited (the SRBs and Falcon 9) and equally-deserving dark-horses (DC-X and Blue Origin). Indeed, from the start of liquid-fuel rocketry, reusability was present. Dr. Goddard reused components of his rockets [1: Alway, Peter. Retro Rockets: Experimental Rockets 1926-1941, p26] and for the same reason that takes precedence in arguments for reusability today: economy [2: Ibid. p28]. The German A5, probably to accommodate Von Braun's incremental approach to development, was, in at least one version, capable of being launched, recovered from sea, and reused [3: Ibid. p66]. In both of these early cases, though, the vehicles involved were relatively small, slow-moving (for a rocket), and carried very little payload. In addition, the payloads were research related and tightly tied to the development of the vehicle. It is an admittedly different situation for ICBMs converted to space launchers or for space launchers meant to accept many possible payloads like Atlas V, Delta IV, Ariane 5, and so on. Reading about the relative successes of the Redstone booster recovery project, and taking it as one fairly prominent attempt at reusability that punctuated many quieter ones, one has to wonder why we insist on building "one-shot" rockets? Is it hubris? A sort of conquering of fire and overwhelming the basic forces that tie us to Earth that keeps us interested in sending them up, but after which we lose interest in the rocket's fate once it surrenders to those forces? Is it desperation? A deep-seated desire to "slip the surly bonds of Earth" that holds such sway we're willing to discard tons of metal, hours of work, and plenty of money just to push a small vehicle out into space? Is it greed? A short-term calculation that the historical investment in rockets allow us to launch money-making packages without the costly investment in landing systems? Certainly economics and the desire for profits has played a part in this. With the fairly quick expansion of rocket capabilities, it became profitable to launch using the research done in the past with minimal additional investment. On the flip side, there was no profit to be had in developing reusable rockets in the immediate term. Additionally it has been an intrinsic property of rockets that they propel themselves somewhere but only an instrumental property that they are recovered. It was, and so far has, remained an investment and when it comes to weighing the future versus immediate gain, we have never been very good. While the technology is a challenge compared to the centuries of rocket development that, with engineers' and scientists' continued contributions, has made rockets ever easier to launch, it's probably never been impossible—just expensive. 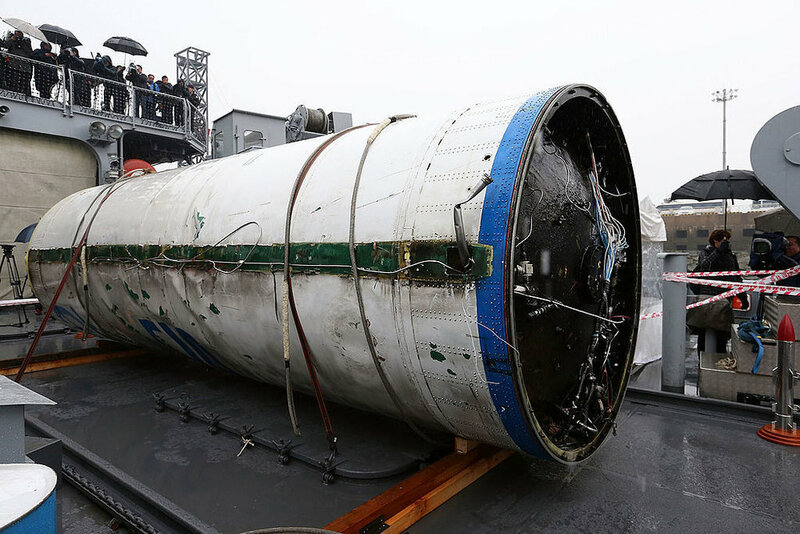 The oxidizer tank of Unha 3 #2 recovered by the South Korean Navy. Though not a rocket designed for recovery and reuse, the potential is clearly there at a loss of payload or fuel—alternatively with weight-savings through structural improvements. Getty Images. Fascinating analysis by Norbert Brugge here. Reading about the recovery of this tank and the fuel tank of Unha 3 #3 (sunk on impact) reminded me of Andrew LePage's interpretation of the Gemini 5 Titan II recovery where the heavier portion of the stage (the fuel tank with its attached engines) caused a bending moment that tore the stage between the oxidizer and fuel tanks. That both launchers use UDMH/N2O4 is also a happy coincidence. Incidentally, the expense and challenge of instituting reusability could be useful. Ernst Stuhlinger's famous letter justifying the exploration of space over addressing Earthly concerns (directly) included the argument that competition in access to space united large groups of people to develop challenging technology that could be spun off was more productive than war which left lots of resources and lives ruined—the only other enterprise with comparable motivational and innovative power. Today you see a miniature race in developing reusable rockets. The leading contestants are Blue Origin (listed first here because they managed to land their, albeit suborbital, launcher before SpaceX, for which they do not receive enough credit) and SpaceX, but ULA has thrown its hat into the ring. Airbus has its own project. But this race is not the kind Stuhlinger was defending. He advocated a race that broke down national barriers and united people in their humanity, this is pure commercial competition, which builds barriers between small fiefdoms within national barriers. While I doubt Mr. Stuhlinger was comfortable with the nationalization of industries, I imagine that he would view these approaches as outside the justification for the space program which he provides. A competition to achieve reusability could be useful in developing spin offs and uniting people like he implies the space program is good for, but thus far what we've seen is not it.